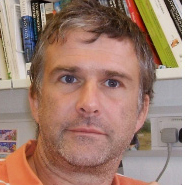 Ever since Simon Valle (now Bangor University) and Nat Annorbah finished their PhDs on Grey Parrots here at MMU, we’ve been itching to start more work on this stunning but troubled taxon. The opportunity arrived in the form of a grant from the newly formed Parrot Wildlife Foundation See their website, a French charity dedicated to parrot welfare and conservation run by Eric Vignot. Stu had spent a very pleasant week in early March with Eric and Irina in Dominican Republic, kicking off Andrea Thomen’s PhD on parrots on that island. Now it was time for something a little tougher. 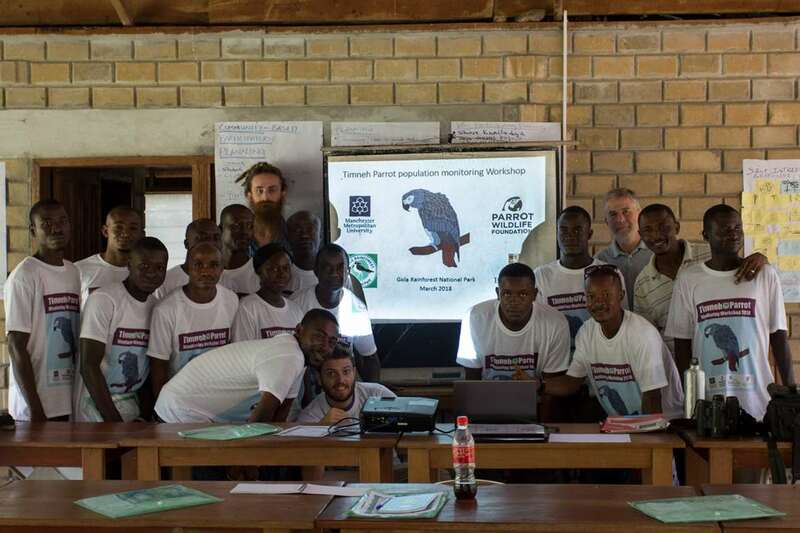 There are two main components to the project – a workshop on Timneh Parrot monitoring and a survey of the parrot across the Gola Rainforest National Park (GRNP). 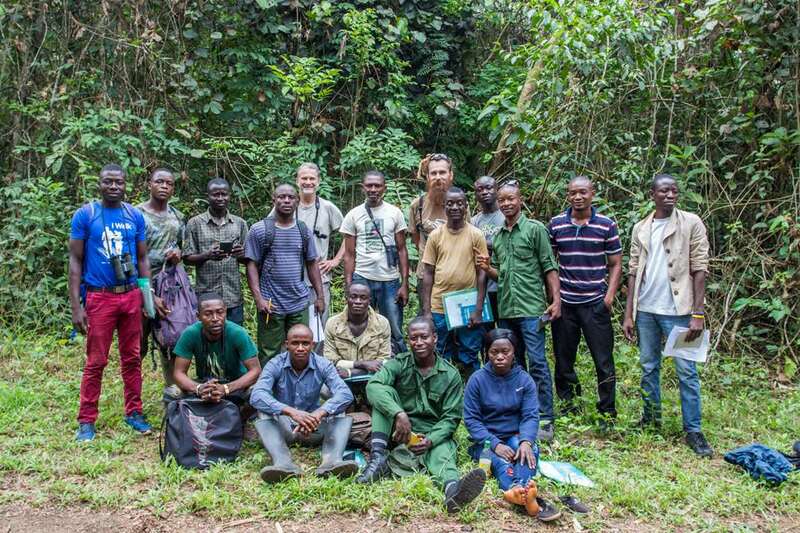 This post describes the former and some thoughts on how Timneh Parrots can be monitored effectively but practically long term across their range. The three-day course took place at GRNP’s research station/guest lodge in Lalehun. The attendees for the workshop represented a number of institutions and organisations working within conservation in Sierra Leone - the Conservation Society of Sierra Leone (CSSL), National Protected Area Authority (NPAA), students and lecturers from Njala University and Eastern Polytechnic, and staff from the Gola Rainforest itself. Mustapha Songe, a tour guide from a community on the border of the National Park, also attended. 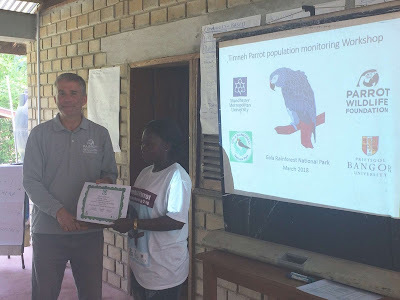 The aim was to introduce delegates to the ecology and plight of the Timneh, train them in a simple method to monitor parrots that can be done whilst conducting their usual duties, and to discuss ways in which a scheme to monitor Timnehs could possibly be rolled out across Sierra Leone. The method itself centres on a paper we published in Oryx in 2015 – we identified the relationship between grey parrot abundance as estimated using Distance sampling and an ‘on-the-hoof’ encounter rate method (simply the number of parrot groups seen or heard per hour of walking or sitting). 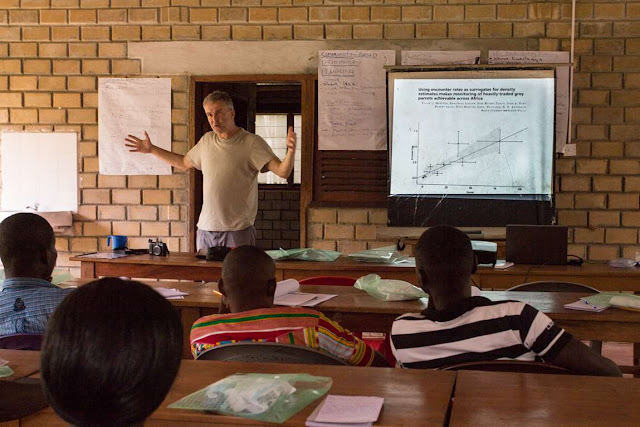 The course included plenty of field practice and discussion, especially feedback on how the method could be tailored for the local situation. We were all delighted with both the level of interest and understanding (many participants had little or no biological training), and the enthusiasm for taking forward a countrywide parrot monitoring scheme. 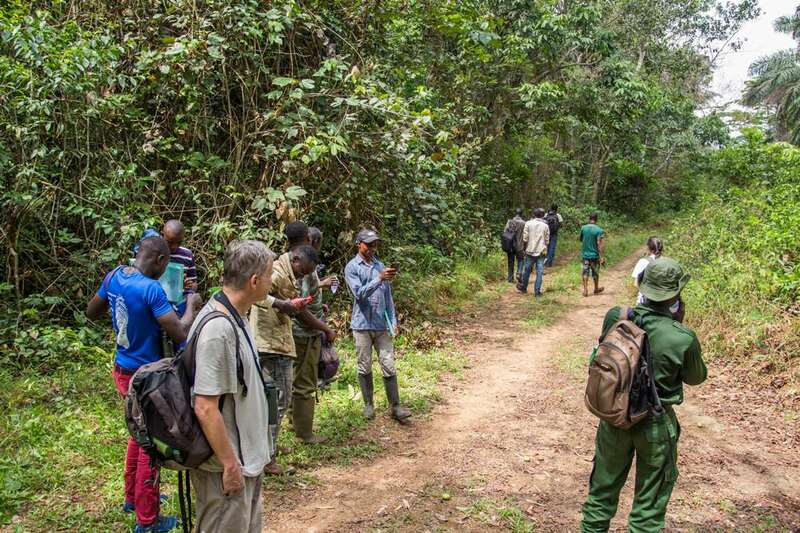 Certainly, Timneh Parrot monitoring is on the agenda for Gola, and we hope elsewhere too. Simon will be visiting NPAA in Freetown to discuss possibilities in other protected areas. The course is only the beginning of our work at Gola. Simon is starting five weeks of fieldwork right across the National Park to estimate abundance and habitat needs of the species. The first step on this exciting journey was to check out reports of a large parrot roost in a community forest close to Gola with Patrick Dauda of the park’s Research & Monitoring Department. We were unable to see parrots at what seems to be a ‘flexible’ roosting area, but hope that Simon and Patrick will be able to return to the site to check on numbers of parrots in the area. We thank: Alusine Kpara, Sheriff Mohamed V, Mustapha Dabenie, Ahmed M Swaray, Amara Aruma, Ibraihim J Kallon (GRNP); Momoh Bai Sesay, Mohamed Sama (CSSL); Osman Deen, Alhassan Khalli Kamara, Abdul Karim Sesay, Wuyatta Kallon (NPAA); Bobson Kobba (Njala University), James Feika (Eastern Polytechnic); and Mustapha Songe (Community tour guide) for interesting discussions during the course. 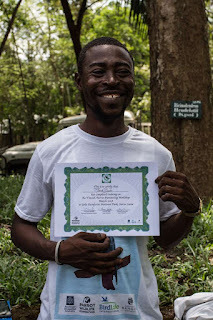 Special thanks go to Benjamin Barca, Brima Sheku Turay, and Patrick Dauda of Gola Rainforest National Park for their amazing support and help with logistics. The project is funded by Parrot Wildlife Foundation.